Simple powerful manufacturing quality control software. 1factory is a complete game changer for our quality department. It reduces time spent preparing inspection reports by roughly 66%. Implementation and full integration took 2 hours. If you are not running 1factory your quality department is behind the times." Easy-to-use. Lightning fast. With all the features you need. Deliver world-class quality. Build customer confidence. Grow your business. 1factory is the fastest drawing ballooning system on the market. 1factory automatically reads and identifies features on your drawing. With simple point and click actions, you can add a balloon, and capture the dimension, tolerance, & zone for the First Article Inspection (FAI) report. 1factory speeds-up the First Article process from drawing balloning through CMM data collection, and report creation, reducing FAI creation time by over 50%. First articles can be created in customer or industry standard formats including AS9102 format. Quickly create quality control plans from ballooned drawings or by importing spreadsheets. Define Inspection Methods and Sampling Rules by Inspection type (First Article, Incoming, In-Process and Finished Goods Inspections). Quality control plans are optionally available with version control to meet document control requirements. 1factory provides automated unit conversion from mm to inch and from inch to mm. So if you receive customer drawings in metric (mm) units, you can now balloon your drawing and create your QC Plan in mm, but yet collect all your data in inches, and finally output reports for your customers in mm. 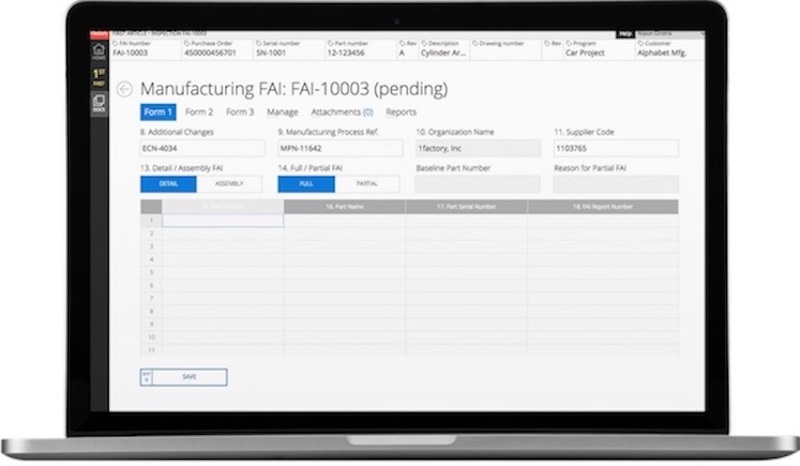 1factory supports data entry from keyboard, spreadsheets, barcode readers, digital gages, CMMs, etc. along with data uploads from spreadsheets and other data file formats. 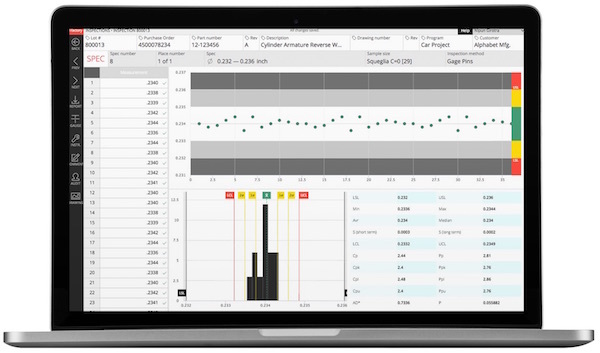 Capturing data directly from the gage eliminates data-entry errors, minimizes the possibility of incomplete or missed inspections, and frees-up a significant amount of QC inspector time. In addition, 1factory provides instant pass/fail feedback, automated Cp, Cpk calculations, and run-charts and histograms so the technician can make adjustments to the process if necessary. 1factory automatically calculates commonly used Process Capability metrics (Cp, Cpk) and Process Performance metrics (Pp, Ppk). 1factory supports calculations for both normally distributed as well as non-normal data (using non-parametric estimates i.e. the median, 99.5th percentile p(0.995), and the 0.5th percentile values p(.005) to calculate Cp, Cpk for non-normal data. Deploy simple visual controls so that factory technicians can ensure product is free of defects. Enhance guard-bands with simple Pre-Control detection rules. Measure and control variation for critical-to-quality characteristics. Comply with AS9103 requirements for Variation Management of Key Characteristics with no extra effort. Easily create and manage NCRs, CAPAs and SCARs for defects, deviations, customer returns, audit findings, safety problems etc. Assign and track action items and ensure timely resolution. Output CAPA into industry-standard 8D format for easier reporting to customers. Easily Pareto non-conformances by part number, type, and cause. Trend non-conformances over time. Version Controlled Quality Control Plans: 1factory provides built-in version control for quality control plans. Any changes made to plans are logged along with user name, date and time. Unlike paper-based quality control systems, 1factory ensures that changes to plans are instantly propagated, and every user is always working off the latest quality control plan. You will never again need to worry about accidentally using a down-rev plan on the manufacturing floor. Digital Data Entry: 1factory supports data entry from keyboard, spreadsheets, barcode readers, digital gages, CMMs, etc. along with data uploads from spreadsheets and other data file formats. Capturing data directly from the gage eliminates data-entry errors, minimizes the possibility of incomplete or missed inspections, and frees-up a significant amount of QC inspector time. In addition, 1factory provides instant pass/fail feedback, automated Cp, Cpk calculations, and run-charts and histograms so the technician can make adjustments to the process if necessary. Easily Retrievable Inspection and Test Records: 1factory makes it very easy to associate dimensional data and certs with "handles" or "tags". Typical handles include: work order numbers, purchase order numbers, data ranges, batch numbers, etc. As a result, inspection records are very easy to retrieve, in the event of a customer or auditor request. 1factory ensures that you are always ready for a customer or regulator audit with QC Plans, Inspection data, NCs, CAPAs and certs all available from a single system. A change log maintains change history down to the field-level for QC Plans. A corresponding log maintains inspection data-entry history, including operator name, date, and time for each measurement and upload. 1factory helps minimize disruptions caused by audits. With 1factory, you can demonstrate process control, and increase customer confidence in your ability to deliver high quality products. 1factory also recognizes the need to protect intellectual property (IP). All plans, inspections, and reports can be shared or delivered to customers with IP sensitive features and data filtered out. Data Security: We encrypt data during transfer using TLS 1.2. The connection is encrypted and authenticated using AES_128_GCM, and uses ECDHE_RSA as the key exchange mechanism. Data is hosted on the Amazon Web Services or AWS GovCloud hosting service. The AWS GovCloud service is an isolated AWS region designed to host sensitive data and regulated workloads including International Traffic in Arms Regulations (ITAR) data. In addition, we use encrypted block storage at the hardware level to protect data and files. Authentication: To access the system, a user must have a valid user name and password. User names are authenticated via email confirmation. Passwords are always stored encrypted. Each user is assigned a role and set of permissions, and every transaction within the system is authenticated against the user's organization, role, and permissions. Up-Time and Reliability: 1factory has been engineered to be highly scalable and available. Over the last four years, we have not had a single unplanned outage. 1factory backs-up database with a daily snapshot. Files are stored on redundant hard-drives and backed up via snapshots.